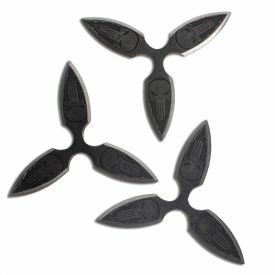 Get yourself a variety pack of throwing weapons with the Dark Skull Multicolor Throwing Knives. 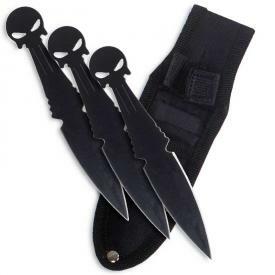 This set of six-inch throwing knives is made out of lightweight stainless steel and features a skull pommel designed to resemble the angry skull emblem of the Punisher. Or any skull-themed character, actually. Each of the three knives weighs just under two ounces and has its own unique color. One knife is yellow and another is blue. 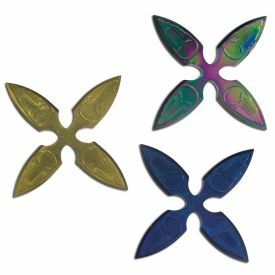 The third one changes color depending on the way you look at it. We call this paradox "rainbow" because of all the colors, but it's mostly a purple color. 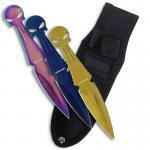 The multicolor skull knives come with a nylon carrying case. You can carry this case on a belt loop and transport your knives with ease.